Firstly, let me explain the purpose of this review. The audition of the Triton Five was never meant to be a direct comparison with my own DIY vintage 12" Philips full-range open baffle speakers. I had heard another model in the Triton series on a visit to New Zealand's GoldenEar importer PQ Imports, and it was Paul Quilter's bubbling enthusiasm and recommendation for these somewhat unusual speakers that led me to want to hear some in my own listening situation. You can read extensive reviews and technical discussions of the design, engineering, and sonic merits of this range elsewhere. I am focusing on my own subjective experience in playing my music through the Triton Fives in my own music home listening room. I have pondered my role as reviewer, and how I can truly convey my user experience to readers. All that I feel comfortable doing here is relating my thoughts as I played my music during a two week audition, courtesy of Paul. 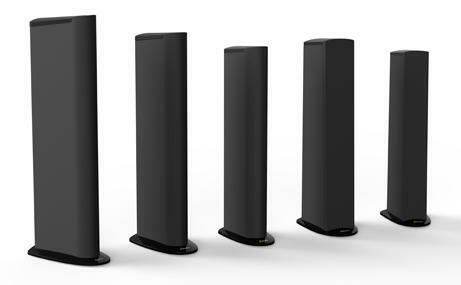 The Five is the second in a range of five models of Triton from Maryland-based GoldenEar Technology. Curiously, they have a fabric sock wrapped around them, and side-facing bass drivers. Immediately apparent is that you don't get a standard wooden cabinet, so you get good impression of what you are paying for in product quantity and quality - costly cabinet finishing is not needed - they are somewhat unassuming, if quite tall yet slimline. The 'sock' is a pleasing way to finish the units without sacrificing a certain contemporary modern style. There is a lot of product for the money. The speaker is 1120 mm tall and each weighs 18Kg. A note to self is here necessary - next time I decide to pick up equipment from the dealer, I should consider just how big the shipping boxes might be! The Tritons are packed in very substantial cartons measuring 400 x 540 x 1250 mm. The warranty of 5 years for drivers and cabinets, and 3 years for electronic components, covers two 6" high-definition cast-basket bass/midrange drivers coupled to four 8" infrasonic planar sub-bass radiators, and a high-velocity folded ribbon tweeter in each speaker. Rubber feet and spikes are provided to cater for various floors. As I listen in my quite modestly-sized room (6.4 x 3.9 x 2.4 m), there is truly a full sound from the little over 20 x 31 x 112 cm cabinets. At high volume, the sound is big, perhaps surprisingly so for a speaker that looks quite slender. Infact, they benefit greatly from turning that volume control clockwise. The soundstage image is precisely rendered and large, with some depth and an obvious left and right sound source, if somewhat clamped around the upper part of the units at driver level, and initially the bass response was suppressed. Paul, helpful lender of the audition pair, advised putting them right back against the wall, and that did the trick. Overall, the sound quality is excellent, with immediacy and presence - although it cannot be denied that the box character is very evident, and I'm not convinced that this 'feels' particularly natural, rather more staged. At all times whilst listening with the Tritons, I was conscious that I was hearing speakers - the performance seems just a little veiled. I was conscious of staring at the cabinets as the source of the sound. On the first couple of listens, I decided I didn't like these speakers. Then I realised I was comparing them to my own. In the inevitable head-to-head comparison that I simply couldn't resist as they stood side-by-side with my own speakers, the tone sounded wrong to me and the soundstage seemed mildly stuffy (pinched, "nasal" ??) when I switched between the GoldenEars and the Philips. On reflection, of course, my comparison is unique in my personal subjective experience, drawing from listening with the open baffles for a couple of years, and I am 60 years old so my auditory acuity will be peculiar to me and have passed optimum. So despite multiple awards, poetic and superlative-drenched reviews, and much technology innovation and engineering effort, I just don't like them as much as my own home-made speaker system - the airy musicality of my 'settled' system's recorded music playback is noticeably lost or at least significantly diminished when I switch to the Tritons. My SOBFR ("simple open baffle full range") speakers sound more musical (I had to try really hard several times to not switch back to my own speakers and so to persist with the audition). But then larger full-range open baffle speakers are usually considered to produce extraordinary sound, with a more integrated soundstage and far less sense of left and right channelled sound sources. I can quite easily 'get into' the soundstage as I listen. I discuss my SOBFR project here. I understand from other reviews that the soundstage has been found to be particularly impressive - but I didn't find that to be so much the case, yet on reverting to my Philips full-rangers on simple open baffles, the music comes alive with space and breadth and punch and delicacy - yes, believability - I am hearing musicians playing, not records reproduced. For me, the presentation of the Tritons lacks great crispness, high frequency delicacy and airiness. Voices and acoustic guitar are imaged well, but everything else seems a bit murky, even wooly and slightly harsh. Bass is extended but lacks that extra-realistic weight and punch - percussive punchiness is constrained. Whilst they don't work for me in my situation, I have no doubt that other music lovers will relish the presentation that these speakers deliver effortlessly, and will favour the neatness of the style and construction. Don't misunderstand me, I don't dislike them. On extended listening, they are obviously great performers, both precise and solid. Yet, I prefer the vintage Philips drivers on the simple baffles. The Tritons' performance is just too characteristically directional and contained for me. 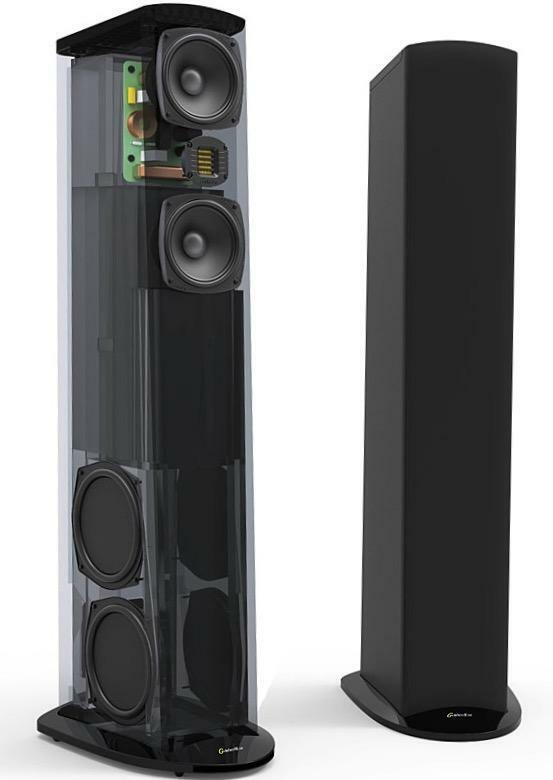 So, just a minute, if the Triton Five is a NZ$3,699 (including GST) product that performs at the "$10,000 or better" level, as claimed by some reviewers, doesn't that suggest super value-for-money, as well as raise some serious questions about what some speaker users are paying for? My diy SOBFR + REL Quake combo cost $1,600 (and wouldn't be to the style choice of many). Are super-shiney rare timber hand-finished cabinets worth $8,000 on top of a say $2,000 driver/cross-over system? I am told that a customer who recently bought GoldenEar instead of super-expensive Sonus Faber thought they were getting far superior value and performance. Food for thought, indeed, before handing that credit card to your local friendly retailer. It took me a while to work out my conclusion, as I got disoriented along the way. I entered into this audition somewhat apprehensively, thinking that I might fall in love with yet another system upgrade. This has proven to not be the case at all. The experience with the Tritons has been so significantly, substantially, and surprisingly other than I had anticipated. And so is the difference in performance of my own speakers and that of the Tritons. And, yes, I do recommend them - with what might be the characteristic Triton sound - for consideration at this price. On this occasion, I can happily return them, safe in the knowledge that my system remains settled and satisfying. I'm sticking with my full-range open baffles. Note: during the audition, both pairs of speakers were powered by my T&A Power Plant Balanced amplifier - with the REL Quake powered sub-bass driver switched off when playing through the Tritons. I gratefully acknowledge the friendly co-operation of Paul Quilter in facilitating this home audition. Paul is a founding Director of PQ Imports, leading importer of carefully-selected audio equipment to New Zealand. PQ Imports are sole agents for a range of high-end audio and related brands, including Graham Slee, Jeff Rowland, Magnepan, Michell, Prima Luna, REL, Sumiko, and T+A.